Some players are destined never to grab the attention. They go through their careers doing little wrong and never letting anyone down; but their no-frills, steady reliability is there to be admired rather than worshipped. Worth their weight in gold, if not delivering too many individual golden moments. Stephen Darby is that type of warmly loved player. Similarly to James Meredith, he is universally liked to the point no one would question his place in the side or value to the club. Week in, week out, Darby gives a 7 or 8 out of 10 performance. Week in, week out, we go home uttering the words “Darby played well today”. But week in, week out, the conversation quickly turns to – and is dominated by – the heroics of one or more of his team mates. Yet that’s everything you want in a full back, really. And, over the years, we’ve had our fair share of suspect right backs who formed part of the blame for the woes of the time – as a result, holding our attention for the wrong reasons. Looking back on almost two decades supporting City, I can count on one hand the number of popular right backs we’ve had – Chris Wilder, Stephen Wright, Gunnar Halle, Simon Ramsden and an on-loan Nathan Doyle. Even then, only Doyle prompted much positive comment, the rest were background noise. Like an electric fan whirring on a red-hot summer’s day, the likes of Wilder, Wright, Ramsden and Halle enhanced the environment around them, but the right back slot is only something truly focused upon when something is going wrong. Yet praising Darby for merely functioning how we think a right back should function would be to do him a disservice and play down the impact he has had on the team over the previous 12 months. He may not appear the catalyst, but the rise and rise of the 24-year-old has helped to spark an evolution in the offensive approach taken by City. If that sounds rather grandiose, think back to life before Darby became a regular and the conceptions that were held back then. “Parkinson clearly bans his full backs from crossing the half way line” was a familiar cry of frustration during the 2011/12 season and even during the early parts of the following campaign. First Simon Ramsden and Marcel Seip (with Rob Kozluk filling in when needed on either side) and then, early last season, Rory McArdle and Meredith were deployed as our full backs and were limited in their attacking freedom. Last October, Meredith attended a Skipton Bantams supporters club meeting and told me that Parkinson had instructed him not to run past and overlap Kyel Reid. Let Kyel and Kyel and not worry about having to track back, it was Meredith’s job to defend not attack. Having made his name at York as an attacking full back there was a hint of frustration in Meredith’s voice. A significant injury to Reid, ruling him out for weeks, gave Meredith a greater licence to roam up the pitch; but it was still short of the kind of up-and-down, over-lapping role he now performs so impressively with Reid. Which is where Darby came in. Arriving at Valley Parade that summer, life had been slow for a player who had just been released by Liverpool. Swapping the reserves at Anfield for a place on the bench in League Two – whilst in front of him a centre back, McArdle, was deployed as right back – was not the scenario Darby would have envisaged as he signed on the dotted line at Valley Parade. Rare opportunities for Darby, most notably a start at Accrington in mid-September, heralded mixed reviews. Whilst McArdle too struggled to impress – his distribution not great for the full back role – the Northern Ireland international was solid and reliable, standing up competently to the physicality of the division. So the back four – without Darby – were playing well, albeit under instructions to defend and provide only limited attacking support. Parkinson deployed two out-and-out wingers in Reid and Zavon Hines, knowing that if they lost the ball in the final third the back four would be in place to defend a counter attack. For a frustrated Darby, it was all too easy to see him go the way of Darren Williams, Paul Arnison, Jonathan Bateson and Lewis Hunt. In and out the club. Long forgotten. Yet opportunity knocked at Burton, late October. Luke Oliver hobbled off injured – he would not figure again for 11 months – and a bad injury to Andrew Davies in the same, costly 45 minutes of football forced Parkinson to look in reserve for the next few months. McArdle, the centre-half-playing-at-right-back, would have to play centre half. Darby got his chance to have a run in the team, and he never looked back. Darby had been substituted early in that September game at Accrington, with Parkinson declaring afterwards that the physical home side had targeted him by deploying a big striker on the left wing. Somehow, this supposed weakness in Darby has never re-surfaced. He was not someone who could be easily bullied, and quickly proved himself to be a consistently steady defender. But there was more to him even than that, and this is where the evolution in City’s approach can be sourced to. As Darby’s confidence and stature flourished, his offensive capabilities increasingly caught the eye. Here was a right back who didn’t simply win possession and then give it to others to create something, he was adept at bringing the ball out of defence and linking up with the man in front of him – Garry Thompson or Hines. And as Darby got better and better in the final third, the balance of the team improved considerably. Suddenly we had two full backs who can get up and down the pitch and create attacking opportunities, two full backs comfortable on the ball and capable of delivering threatening crosses. Darby, and Meredith, were both off the leash. The half way line no longer a boundary that cannot be crossed. For Darby, the establishment of himself as a regular right back for the Bantams represents the greatest period of stability in his still-fledgling career. Progressing through the Anfield youth ranks (he captained the academy and reserve teams), Darby made his Liverpool debut at – no less – the Vicente Calderon stadium, home of Atletico Madrid in the Champions League, in front of 55,000 people, back in October 2008. Rafa Benitez introduced Darby for Xabi Alonso on 75 minutes. Darby was not the first, and won’t be the last, young English player to struggle to earn first team opportunities at a major Premier League club. In total he played six times at Liverpool (three in the Champions League) before undertaking numerous loan spells at League One clubs, aimed at building his experience. Back at Anfield, a managerial merryground gathered pace following Benitez’s departure at the end of 2010, with Roy Hodgson, Kenny Dalglish and then Brendan Rodgers implementing their own ideals and players. Darby’s face didn’t fit. So he headed to Bradford City, even if his arrival was – in typical fashion – overshadowed by someone else. The story goes that Parkinson was watching videos of Darby playing on loan for Rochdale during the 2011/12 season, as he weighed up whether to sign him, when his team mate, a balding central midfielder, also caught the manager’s eye. A quick phone-call to a holidaying Steve Parkin for a reference later and the wheels were in motion to sign Gary Jones. Darby did at least eventually follow. There is a mixture of excitement and apprehension when young players released by huge clubs such as Manchester United and Liverpool rock up at Valley Parade. In the one sense we know that they were once viewed as amongst the best in the country for their age. They will have subsequently benefited from top-notch academy coaching and learned to live up to incredibly high standards – and even if they don’t make the first team grade, there’s no real disgrace. After all, these types of clubs have the financial clout to spend millions of pounds on world class talent, severely restricting the path of their own youngsters. Yet whilst the likes of Ben Muirhead, Eddie Johnson, Gareth Evans (Manchester United), Robbie Threlfall (Liverpool) and – going back a bit further – Isaiah Rankin (Arsenal) would really look the part on their day, doing it week in week out would invariably allude them. It’s probably down to mental strength: being capable of not just playing at the top of their game in a few professional football matches, but being capable of playing at the top of their game on a consistent basis for weeks, months and years. So solid starts to Bantams careers would fade into mediocrity, and they’d one day depart and struggle to earn a chance elsewhere. This is where Darby has differed. It’s not just the fact he has proven himself to be an excellent player, he displays remarkable levels of consistency. Last season he came from the cold of barely figuring in the first three months of the season to finishing third in the Width of a Post player of the season vote and was the players’ player of the year. The standards that Darby initially set once he got his chance were high, and he has maintained them ever since. The step up to League One is being achieved with a characteristically minimum level of fuss. Perhaps it is down to all those loan moves he completed whilst still a Liverpool player. Swindon, Notts County and Rochdale. He’d played 70 league games before he even joined the Bantams, learning all about the challenges of lower league football along the way. When he signed for us, Darby was less a Liverpool right back and more an up-and-coming lower league footballer who had the temperament, skill-set and know-how to succeed in these less glamorous but more physically demanding surroundings. There are always winners in football and there are always losers. 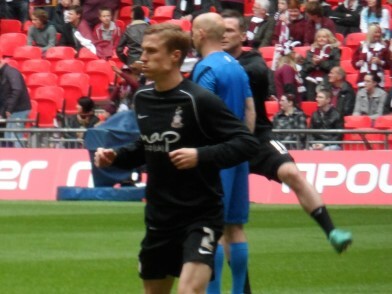 Stephen Darby was a big winner when Luke Oliver ruptured his Achilles just shy of a year ago. But as Oliver returns to first team contention, Darby might feel a degree of anxiousness about whether things will shift back to the way they were. The outstanding centre back partnership formed between McArdle and Davies makes it hard for Oliver to regain his place, but then again Oliver and Davies are proven to be an outstanding centre back partnership. Move McArdle over? Drop McArdle? Keep Oliver in reserve? It seems implausible to leave out Darby given how well he has performed over the past 11 months – and the attacking balance he gives to the team, which McArdle could not replicate. But still, competition for places has been heightened by Oliver’s revival, meaning the likes of Darby are just one or two poor individual performances away from the idea of a defensive reshuffle being floated. The quality of consistency Darby has demonstrated will now define his immediate future. The challenge is to maintain his high standards. Keep giving us 7s and 8s out of 10. And continue doing everything he can to avoid the attention. Another nice well written article. I finally got the chance to watch the play off final last week, and that match sums up Darby’s time with us. Very early in the match their much heralded left winger got past him and managed to get a cross in………… but he never managed to do it again, and the supply to Platt and Akinfencepost was reduced to long balls from deep positions which Davies and McArdle handled with ease. He has been an excellent signing for us.